Identification: This is a slender species with papillae on the posterior edge of its rhinophores. 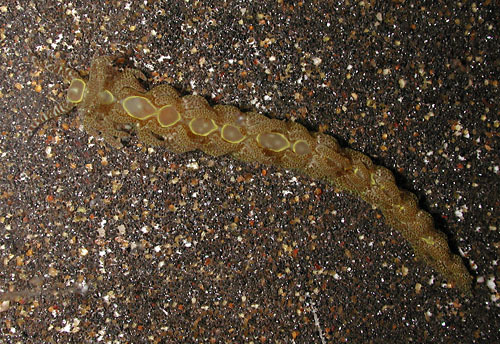 The cerata have larger brown spots than in Limenandra confusa and fewer papillae. The notum is decorated by a series of yellow rings enclosing cloudy, pale-pink spots. Larger animals have more cerata in each arc. Natural history: Limenandra rosanae is a moderately common diurnal species found in protected to exposed rocky habitats and in Halimeda kanaloana beds. It occurs at < 1 to 18 m (< 3 to 59 ft). A large animal dislodged from a colony of the small form of Aiptasia pulchella rolled into a ball making it look remarkably similar to a dislodged anemone. Large animals found associated with a bloom of the swimming anemone Boloceroides mcmurrichi fed readily on that species in a dish. (see photos) Its egg mass is a white spiral composed of a "kinked" ribbon. Hatching occurres in about three days in the laboratory. Distribution: Big Island, Maui, Oahu and Kauai: widely distributed in the western & central Pacific. Taxonomic notes: This is the species listed as Baeolidia nodosa in Bertsch and Johnson, 1981, Kay, 1979 and Gosliner, 1980. It was first recorded in Hawaii at Kaneohe Bay, Oahu by Terry Gosliner on Sept. 15, 1973. Photo: CP: 32 mm: Kenolio Park, Maui; Dec. 11, 2014.